Adien has been wanting to write this book for quite some time. 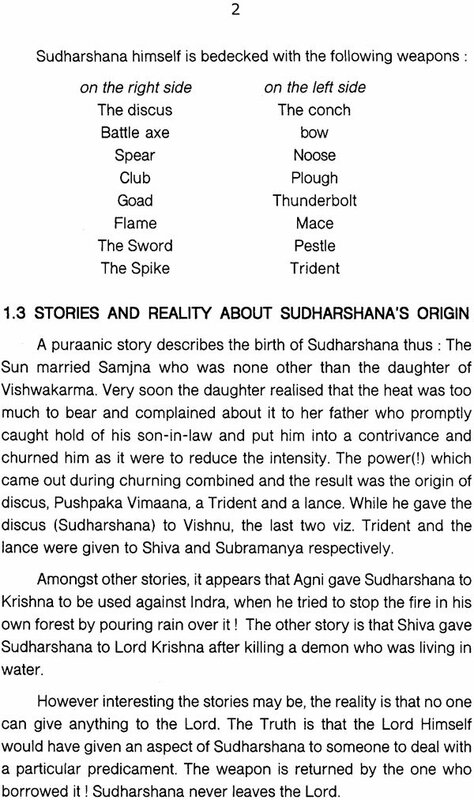 It appears that Sri Sudharshana's anugraha had to materialise and it happened only recently. The unique power of the extraordinary combination of Sri Sudarshana and Sri Naarasimha cannot be overstated. It has to be experienced. The greatest example is the quick response of Sri Sudharshana to Swami Desikan's prayer to him in his Sudharshanaashtakam when hundreds of people were dying due to a strange epidemic Sudharshana-Naarasimha yanthras have helped people over centuries in warding off difficulties and evils. I thank Smt. Sudha for attractive DTP setting and Sri Sharada Prasad for the nice printing. Kiran Ranganath has designed attractive cover. I thank them all. The weapon supreme of Sri Mahaavishnu is the power- personified, Sudarshana Chakra (discus). 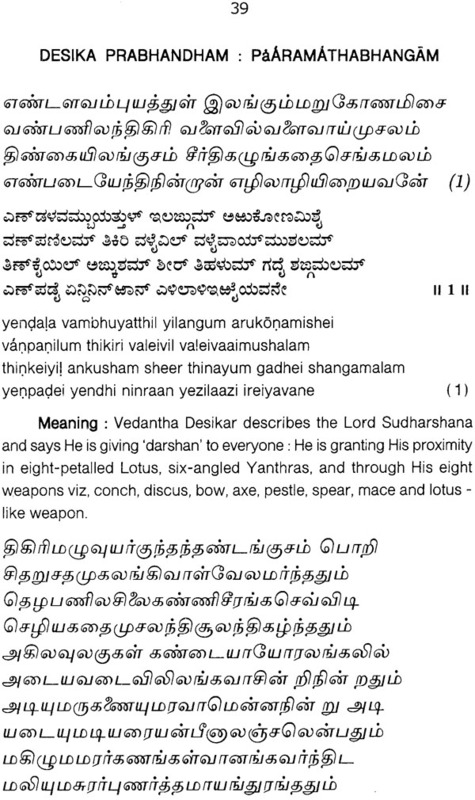 Sudarshana has many names, In fact Sudharshana stands for Vishnu Himself and is rarely separated. When not in use, it serves as an embellishment to the Lord. The unique combination of the Lord Himself as Narasimha with Sudharshana provides him extra strength and awesome power. This combination came into prominence around the 13th century. The two together appeared as idols in temples and as 'Yanthras'. Those who had been suffering for long and poverty-stricken found the worship of Sudarshana-Naarasimha, and the Yanthras extremely beneficial in warding off evil. The greatness and efficacy of Sudarshana have been described in Vedas, Sri Vishnu Sahasranaama, Srimad Bhaagavatha and more recently by aachaaryas like Sri Vedantha Desikar in sthothras, and 4000 Divya Prabhandham. In fact it was Sri Vedantha Desikar who first recognised the loftiness of Sudharshana in conferring benefits to people suffering due to epidemics, ailments etc. 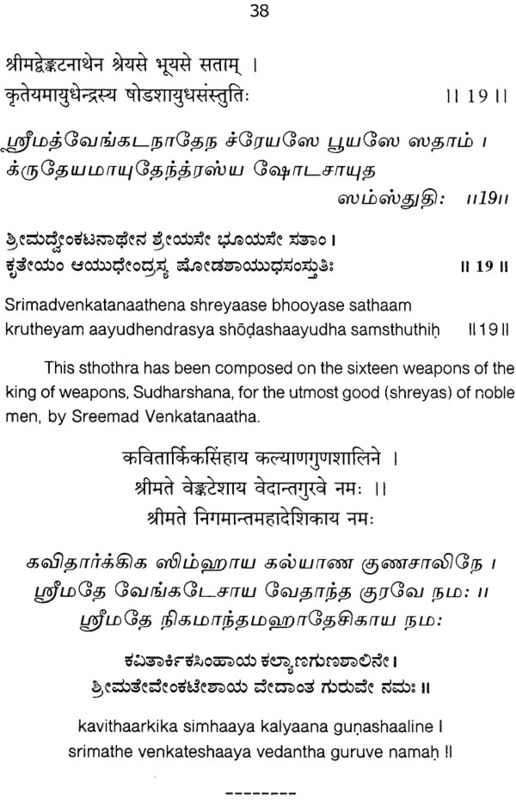 Sudharshanaashtaka, a sthothra of a mere eight stanzas was composed when a large number of people were dying due to a mysterious disease and the benefits were immediate. The Lord as Naarasimha demonstrated His omnipresence and that He is the Supreme Person. The power and strength He brought to bear in killing Hiranya Kashipu were extraordinary. It is said that Sudharshana in the form of Narasimha's nails killed the demon. 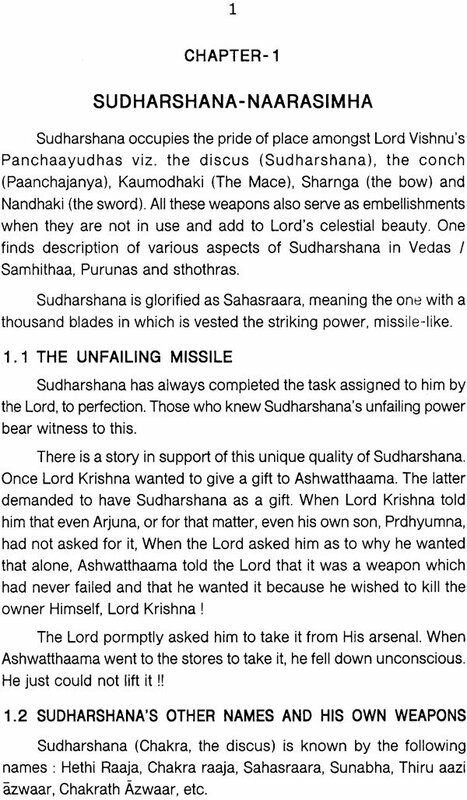 The combined power of the Lord Himself as Naarasimha and Sudharshana (with delegated power) is so formidable that only foolish demons had posed a challenge and got annihilated. We shall be covering in this short monograph Sudharshana's greatness as depicted in the Ahirbhudhnya Samhitha, manthras, yanthras with Naarasimha, and a review of religious literature on Sudharshana.